The mojo bag for red Fast Luck is always red -- and, truth to tell, most mojo hands are red, no matter what the condition. If the order entry person forgot to note the candle colour you requested on the invoice or if the order puller made a mistake, please telephone the shop during business hours. We will send replacement candles the same day. Thanks for your kind advise Cat. May I verify that if this is the case, can I use the red coloured candles that was shipped to me to work on the spell for money luck then? Or Green coloured candles should be the right ones? I am myself learning about hoodoo and it seems sometimes we confuse ourselves. As I have learned, if you want to conjure then if the method for Fast Cash is always red why question it? I know questions are good and I certainly ask many myself.. Plus since Catherine advised you on this why question it still? I know some things are not set in stone but to change colors seems a big change. I have followed every bit of advice I was given or that was given to others and everything I have conjured thus far has and is working. Please specify GREEN candles for MONEY LUCK or RED candles for LOVE LUCK. As you can see, it stated very clearly over there to 'Please specify GREEN candles for MONEY LUCK or RED candles for LOVE LUCK.' I just want to be sure before I started on it if you understand where Im coming from. I too want to follow every bit of advice that was given but as you can see from here, I am super confused!! I see! Got cha. I suppose then the red mojo bag then is correct. I like you am fairly new and just hope to encourage and learn in the process. The staff at LM has been exceptional with me when I had questions regarding my orders and probably calling them is the best idea given by Catherine. Hey do you think you might need some love work as well? I like to think we experience "serendipity" when there is some kind of "difference" if you will.... At any rate, all the best!! Lurker here. I'm not clear about what to do with the petition paper after writing the desire & crossing it with a name 7 times. The directions say to "place the paper in the incense & light it." Does the paper get burned up in the incense? Yes it gets burned up. I am interested in putting together my own Fast Luck spell for use in playing the lottery but I have some questions. 1. In the Fast Luck spell kit what size are the candles? 4" or 6"? I'll need to know this to buy one of the two different star candle holders. 2. What is the idea behind including the 7 Herb Spiritual Bath in the spell kit? Is some of the left over water after a bath used when washing my clothes (as in "dressing for luck/success")? You can use whatever size you choose. One candle will probably burn faster than the other due to the height (less wax to burn). Please follow the directions in the spell kit on how to dispose of the left over water. I finally got my fast luck spell kit for money/prosperity. I need help wording my petition. Basically what I want from this work is: for my business to prosper, thrive, succeed and come back to life [it's been in the dumps for a while]. I want lots of new clients. I want consistency in clients and earning and I want to earn X number of dollars per year so I can support myself comfortably and get my own place. I don't want to muddy up the request and I want to make this as clear and concise as I can. Yes, I am doing the mundane work as well as the previously posted advice on attracting better business using conjure work. I wouldn't use the phrase "come back to life" because in a way it is affirming the negative state of your business. The rest of the statement you have is very good. You may want to work a specific montery goal into the petition. For example, say you currently make $2500/month, but want to make $5000 - put that into the petition statement such as "and increasing my income to at least $5000 per month". Giving a specific number to work for seems to yield results that are more exactly in line with what you want in my experience, then leaving it un-defined. Thanks for the input. I was not going to put bring back to life:), i was just describing what has been and I plan on changing that. The idea of being specific with the dollar amount is great - makes perfect sense. Good afternoon family, I recently received my first order which was the fast luck spell, I love everything about it especially the lil fish you get as a gift,its so cute. My problem is that there certain things in the spell that I can't get done due to the fact that I take care of and reside with my elderly grandparents,I can't do the initial herb bath or the altar,they are up at 4am every morning,and my grandmother never leaves home during the evening when I get off work, and I can't do the altar layout either,so my question is...is there another way to handle this or are there other products that I could order that are more discreet...however,I will say that the mojo bag,the oil,incense,and powder are working pretty good on their own,I even feel lucky...but I would like to seal the deal with my work...any input is greatly appreciated! Thanks! 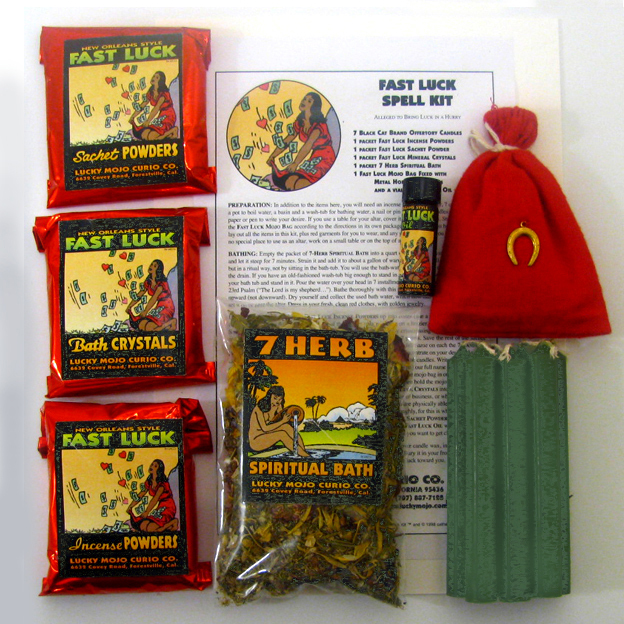 If the Fast Luck kit comes with a packet of Fast Luck Crystal Salts, and you cannot get up even earlier than your grandparents and do the traditional hoodoo bath, you can add a pinch of the salts to each load of your laundry. Add the salts to the rinse cycle, and that way your clothes will be "dressed" for Fast Luck. You can have Lucky Mojo burn a Fast Luck dressed vigil candle for you on their altar, and they'll send you a report afterwards of how the burn went (to show you how your petition is favored by Spirit). Surely you can take a bath at home. Just use a muslin bag so the herbs don't clog the drain. You can also wear the oil and/or powder, and carry the mojo. Thanks Mary Bee and Mama Micki,I wear the mojo daily, and the oil and powder,and they go great with my phermones, I have a small mesh bag and I can get my bath water really hot for the herb bath and I already bathe in the other crystals,I was just concerned about the effectiveness if I wasn't able to do it just like the spell says,I also burn a candle dressed during the day while im at work,but I will get a lighting done just for an extra boost.....thanks so much for your time,I love my LM family,you guys are absolutely AWESOME! Hi. I was curious to know...I want to purchase a FAST LUCK spell kit for MONEY IN MY POCKET. Because of my apartment rent, furniture, food, etc., I want/need $$$ before I move in. But I didn't know if it was just used for GAMBLING AND BUSINESS predicaments. I wanted to see if It was appropriate to use it for that reason. Instead of MONEY DRAWING, OR MONEY STAY WIT ME, because once I qet my new place, I want to USE MONEY-HOUSE BLESSING kit for that siqnificant reason. I'm also ordering CHINESE WASH && PEACE WATER to wash down from back to front out of my new apartment. Overall...may I purchase the KIT to qet MONEY in a 'FAST LUCK' hurry.... in my pocket? && Do I have to order 7 packets of herbs for the 7 day herbal bath or just use the herbs in 7 portions? thanks guys. Fast luck is not just for gambling and business. The fast luck is to change your luck in a hurry, or fast manner It is used for fast luck in whatever, but in this situation it sounds like you need to approach thing different. I think it would be best to work with money drawing,and fast luck together if you need the money in a hurry, and then follow up with some money stay with me as well. You may want to look into road opening products to help remove any potential obstacles. Remember the money isnt just going to fall out of the sky especially if you need a certain amount of money. I mean if you just petition that you need quick money, you may find money a $1 on the street. I would recommend strongly about practical ways you can get more money such as overtime with your job, getting a second job, etc. You can divide the herbal baths over 7 days. You do not need to buy 7 packets of herbs. I will petition the ways I can qet more money [in which Lowe's pays qood $$$ anyway] so overtime, raise and etc. And thanks!!! I just want to use the MONEY DRAWING AND HOUSE BLESSING in conjunction with MONEY-HOUSEBLESSING for my new place. So I don't have to repeat 2 thinqs in one place if its combined in both. Thanks mucho!!!! 1. May I get a VISUAL version of the 8 POINTED star with the 2 squares so I know what i'm doinq with the sachet? 2. What may I do with the 7 HERB Bath remains? Would I use them aqain or bury with my ashes and wax? you can google 8 point star you get many examples ..basically it looks like a square with a diamond laid over top of it. TBanks91 wrote: 2. What may I do with the 7 HERB Bath remains? Would I use them aqain or bury with my ashes and wax? If you didn't use the whole pack to make the bath, you can save the rest of the herbs to use at another time. If you meen the herbs you have strained away, you can indeed bury them with your ashes and wax. @J...thank you for the help sir. Keep in touch. @Miss Ida...thank you for your reply as well....I was told to freeze them and to reuse them as well, but its nice to know I can bury them with my work. Thank yoyu both! I just recieved a Fast Luck spell kit. It does not say anything about doing the work at Dawn. Does that mean I can do it right now? I am asking because I would like to do it while no one else is home. I have a roomate. Thanks. You can do the spell kits at any time. Doing work at a particular time is a way to enhance the work. I don't know if I am posting this in the right section, but my question is about burning the petition paper. The fast luck spell kit calls for you to burn the petition in the incense. What is the purpose of this? I am asking because I have read in the forum that burning is a way of undoing work. Does it depend on your intent? Could I burn other petitions in incense for other things as well? For example, if I wrote out a petition for money and had money drawing incense, could I burn the petition in the incense and would it be beneficial, or would I be voiding my petition? Hi: I bought the Fast Luck Spell Kit and did the spell this morning starting before dawn. I took about five hours to complete and I am exhausted. How long does it normally take this spell to work? the following forum thread discusses the signs of spell-work manifesting and completion: signs-movement-completion-of-spells-que ... t6436.html. If your questions aren't answered once you read through that information, then feel free to post. I am also moving your post into the longer thread on the Fast Luck Spell Kit which you may also glean some useful information from. Thank you Aura! I think that I am seeing movement, but am new at this. I did the spell on Monday and won tickets to a concert on KFOG, won $200 on a scratcher, and won two online casino tournament .1 and .10 for a total of a whopping $1.90 (LOL)! I tried to tournaments to test my luck. My question is if I want to hit the CA lottery, should I have said: I want to win the CA lottery? Should I be really specific in requesting what I want? I just said, I want to be Lucky. Please advise. Thank you! Brand new to this forum. Have had some great success in the last few days with my first spell kit, 'Fast Luck', betting football online. I won three games and about $400! How long does "Fast Luck" last and when should I move on to something like "John the Conqueror" for more long term financial success and stability? Thank you! Welcome to the forum! If you would like, please introduce yourself (on the introducing thread) so that we can formally meet you! My advice to you (and I always do this myself) is to have another spell kit on hand. When you see that the luck is beginning to fade, then start up another spell. Don't wait until the effects have completely stopped. Just when it starts to fade. And, you can start the other spell anytime now. I just read your response to Fourdogs and does that mean that when we can start up on the same Fast Luck spell kit again? or is there another spellkit that we can do for lottery and scratch? Lots of spells there. Many good ideas for you. Also, I am not sure if you started a spell kit and didn't finish it or just want to buy another one. I'm sorry but I can't remember your past posts (except for the trouble with your neighbors!). Well tommorrow It will be 3 months since I did the Fast Luck spell so I will continue to burn the incense and spread the sachet powders and maybe I will re-write the petition that I had once made. The Fast Luck did bring me luck in the lotteries with small winnings and I even won $60.00 in a Triple Play Scratch ticket in which I have never won before so I am very happy with that. I think I have purchased a Lady Luck triple strength mojo bag that I have never ended up touching so maybe I will read up on how and when I can go abouts making it active. Okay Thank You and wish me luck please! I just wanted to share an experience I had with the bottle spell. Situation: My car got broken into and lot of valuables and sentimental items were stolen. The car's locking mechanism was destroyed and the alarm was ripped out. The push button ignition was non responsive and I thought that we would surely need to spend lots of money to replace or fix it. Money is tight, and so I wrote on parchment paper my petition for no out of pocket costs, placed it in the bottle, shook it up, and lit green candles on top. After filing a police report and getting a tow truck to come pick us up, we walked to the car and found a man actively robbing it (this would be the second time it got broken into THAT same day). After a confrontation, we found that the man we caught had completely repaired the car. We still had the car inspected to make sure nothing else was broken and all security features are active, just to be safe. The result: After what I thought would be a costly experience (in terms of inspection and repair fees or replacement costs), I was delighted to find that we did not have to spend a single penny! They even waived standard inspection fees! I "wished big" for my petition because I was sure I would have to pay some sort of fee from the incident and I was doubtful of the spell's efficacy. However, I found that my big wish was granted in that there was NO OUT OF POCKET COSTS.